The PDUV30HV 5/5.8kW Single-Phase 208/240V Basic PDU is a versatile no-frills unit for data centers, server rooms and network wiring closets. Perfectly suited for high-density IT environments, the PDUV30HV features 38 total outlets—32 C13 and 6 C19. The NEMA L6-30P input plug with 10-foot (3 m) cord connects to your facility’s compatible AC power source, generator or protected UPS to distribute power to connected equipment. The switchless design prevents an accidental shutdown, which could lead to costly downtime. The 63.75-inch all-metal housing supports 0U vertical mounting in EIA-standard 19-inch racks using the included hardware or toolless 0U mounting using the included buttons. You can also mount the PDUV30HV under a counter with the included brackets and user-supplied hardware. Included C20 and C14 plug-lock inserts attach to the components’ plugs to keep them connected and continuously powered. 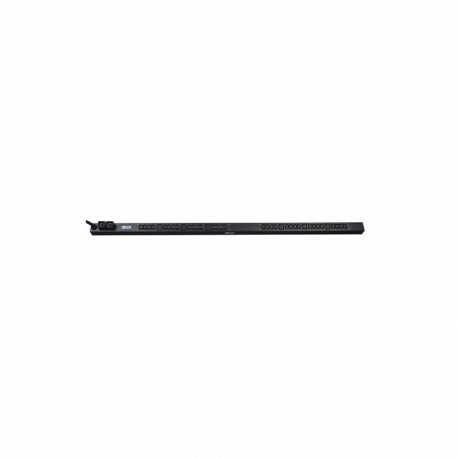 Tripp Lite 3.2-3.8kW Single-Phase Switched PDU, 200-240V (7-C13 & 1-C19), C20/L6-20P Cable, 0U Vertical, 39 in.